That statement was made by the BBC’s Editorial Complaints Unit just a few months ago as part of its ruling on a complaint. The January 7th edition of BBC Two’s flagship news programme ‘Newsnight’ included an item concerning the French government’s request to ban shows by the ‘comedian’ Dieudonne on the grounds of threat to public order. The programme can be seen here by those in the UK able to view BBC iPlayer, with the relevant section beginning from 38:00. An audio version of Schofield’s report was also promoted on BBC radio and on social media, so those without access to iPlayer can hear it in this podcast or from 16:30 here in the January 7th edition of the BBC Radio 4 programme ‘The World Tonight’. 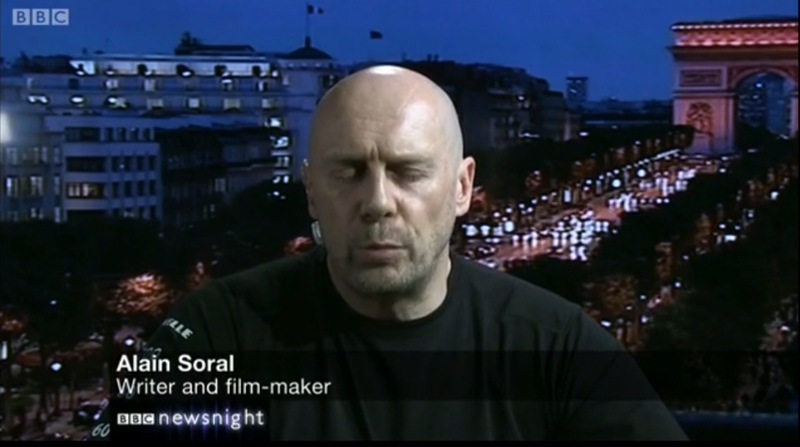 Following Schofield’s filmed report, ‘Newsnight’ moves on to an interview with one Alain Soral, who is introduced to BBC audiences by the programme’s presenter Jeremy Paxman as “the French writer and film-maker Alain Soral” (with the same description appearing on screen) and described as “a close friend of Monsieur Dieudonne” who “helped him popularise the infamous quenelle gesture”. Had viewers been informed of Soral’s background, they may of course have been able to put the statements he makes during the interview with Paxman into their correct context. But they were not, and instead Soral’s Far-Right affiliations and record of antisemitism are obscured by the fluffy description of him as a “writer and film-maker”. There is more, but readers have no doubt got the antisemitic conspiracy theory gist by now. 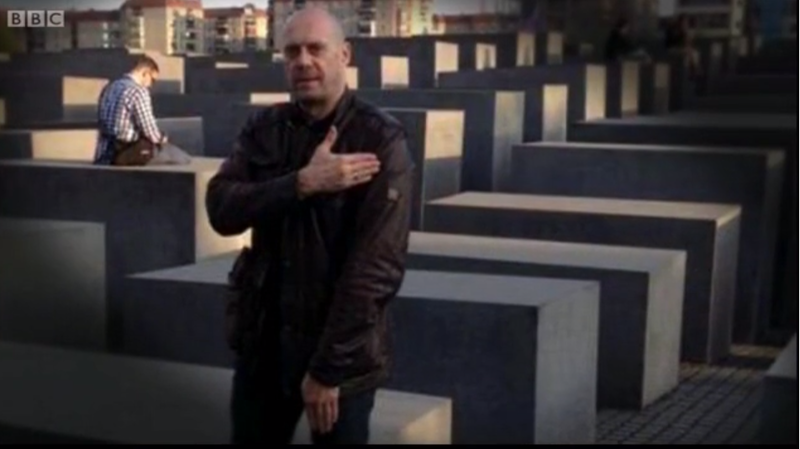 In fact, a photograph of Soral making the quenelle gesture at the Holocaust Memorial in Berlin appears in Hugh Schofield’s filmed report, but – as the CST notes – apparently no-one on the ‘Newsnight’ team was able to join the dots. The fact that ‘Newsnight’ breached BBC editorial guidelines on impartiality by not informing audiences of Soral’s “particular viewpoint” is abundantly clear. What is less comprehensible is why in the first place the editor of the programme considered the airing of Soral’s antisemitic conspiracy theories to be of any contribution to the public’s understanding of the issue under discussion and why the BBC continues to be incapable of improving its increasingly dismal record on the reporting of antisemitism.